Here's the one I found last night, about 35 yds from the feeder. Went back this AM to search for the other one. Still found no blood trails, but did find the front part of one arrow, and a little blood on a tree. 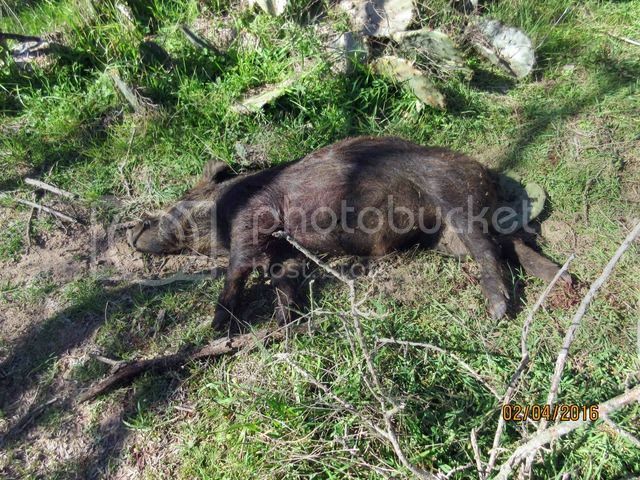 Walked the open area in the pecans first as it was in a direction they often come from--nothing, then I started at the back of the property in the thick stuff--lots of sign, but no dead piggie. Gradually worked my way back towards the feeder and at one point, caught a whiff of pig. Gradually worked in towards the feeder and walked up on #2. Looked like she had been shot in the throat--WTH? Both of the ones last night were behind the shoulder. Started back to the feeder along a cow trail, and lo and behold, I walk up on this guy. This is obviously the one I smelled too. 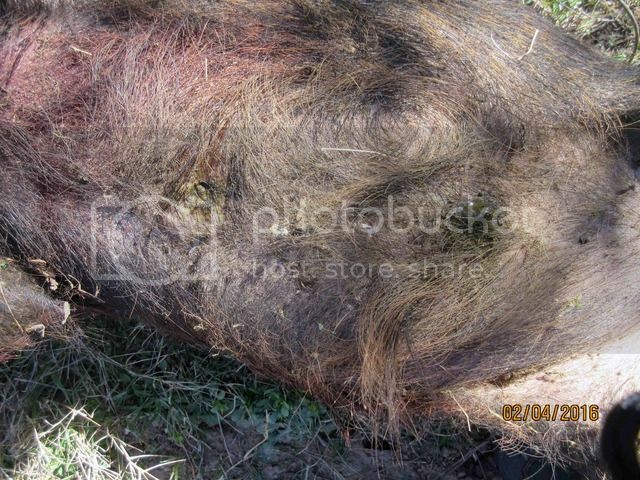 When I rolled him over, I saw pig poo and pus oozing out of two holes in his belly--not fresh wounds for sure. Possibly the cow man gut shot him intentionally as he does. 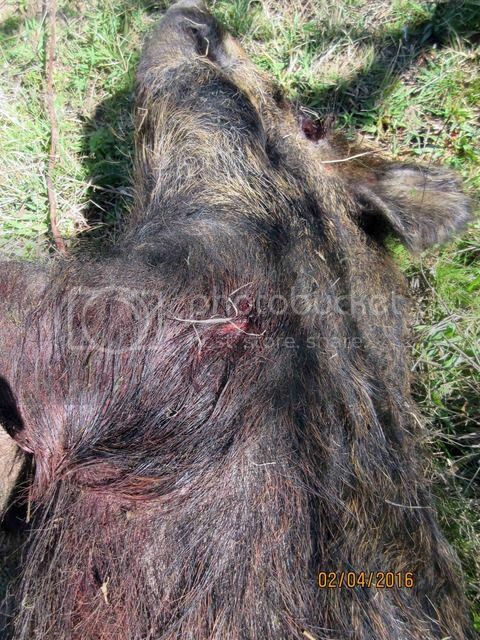 Or, maybe been in a fight with another boar with teeth and got poked in the gut? Here's the exit wound from the BH and last night's shot--don't think it got his belly. As I walked back to the feeder, about 30 yds away, found the other half of the arrow, and there was a fair to good blood trail--when the sounder scattered at the shot, this one didn't go the direction I thought he did, and I never walked over in that area last night. 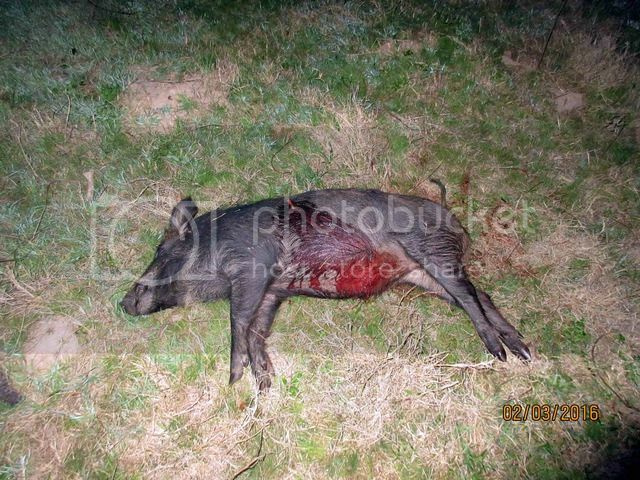 So-I think what happened, the first one I shot had a second pig behind, and the arrow got it in the neck through major blood vessels. First time I've had a two-fer with a bow although I've done it several times with a rifle and shotgun. Last edited by dustoffer; 02-04-2016 at 11:59 AM. Nice! 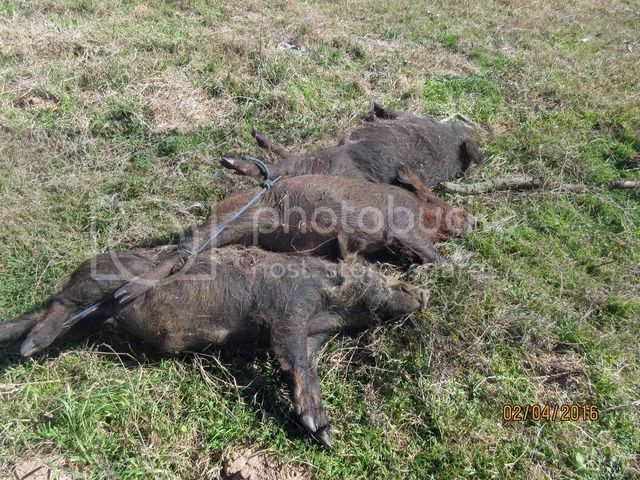 I guess gut shots don't always kill hogs. They are very tough critters. Great job and read. Congrats.